I have never found a such remote tester circuit that can be as easily made as this following. Remotes work with a digital signal which is nothing but 1?s & 0?s. We can see remote working or not, in our mobile’s cameras too. Here is a handy gadget for testing of infrared (IR) based remote control transmitters used for TV, DVD, DTH etc. Actually it is nothing else than a simple light detector made upon a cheaply available LDR. This is just a light detecting circuit. We shouldn’t expect from it to work from far distance, etc. It’s a basic light sensing circuit. This circuit consists of one LDR, one CR2025/2032 battery, one BC547/548 transistor, one biasing resistor(100K). LDR is light detecting resistor whose resistance increased in dark, and decreases in light. This is not based on Infrared sensor IC, which supplies the binary data received from remote. It can be easily made without any PCB, vero and can be fitted well within a matchbox. Only thing to be taken care of, is to put LDR in 1cm deep from matchbox, with a hole in front of it. We don’t want normal light to easily affect this LDR and give undesirable results. The schematics below. Can easily check Remote controls with a radio. on radio in AM Band and press the remote keys (Try to place remote near to Antenna Coil), can hear a beep sound in radio speakers. February 17th, 2011 at 7:58 pm@Anish K.S, Nowadays, not everyone have a radio, especially AM one. 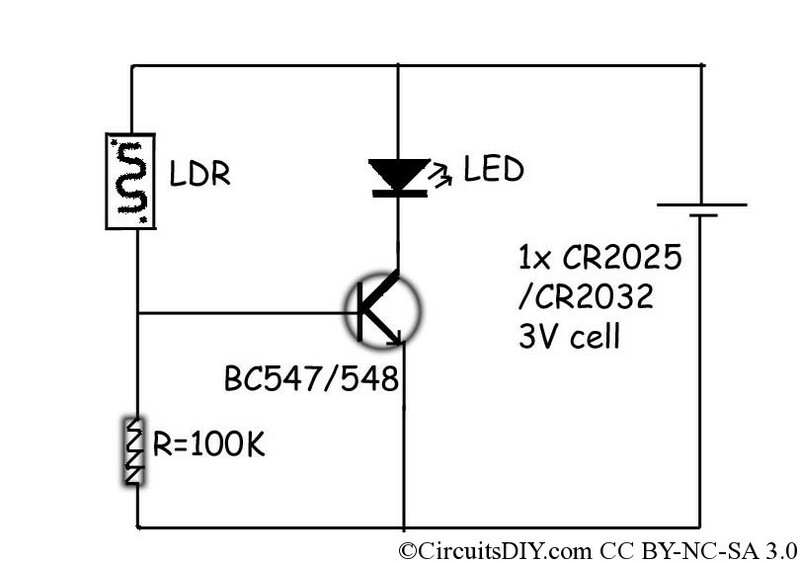 So, this circuit costing 10 rupees is ideal, instead of buying a IR receiver based remote tester for 25 rupees. @Anish!We are in 2011,even very hard to see AM receiver now a days! @Admin!Yes,10rs is better than 25rs! Very nice website,first time here to see very interesting electronics articles!Thanks for this nice one! no circuit is required to check the remote.Just press any button & take IR led part of the remote a snap(photo) using camera phone ,if u find light glowing in the snap then the remote is ok.
October 29th, 2011 at 2:09 pmsuperb pavan. thanx this is a unique idea. cheer up. its hard to find an easy and brilliant idea, we hv to thank to Arup’s job. i have a transformer which has written 0-6-12, 5 A.M.P. charger. one side 5 and another side 3. these wires which use for ?. how much it output. how can i measure it ? I have one more way which I use all the time. Human eyes cannot see IR light from remotes but cameras can see. Use your mobile phone camera or something in video mode to see the light from remote and you would be able to see it through camera if it is working.